Hosting a party for the big game, and looking for some healthier snack alternatives? 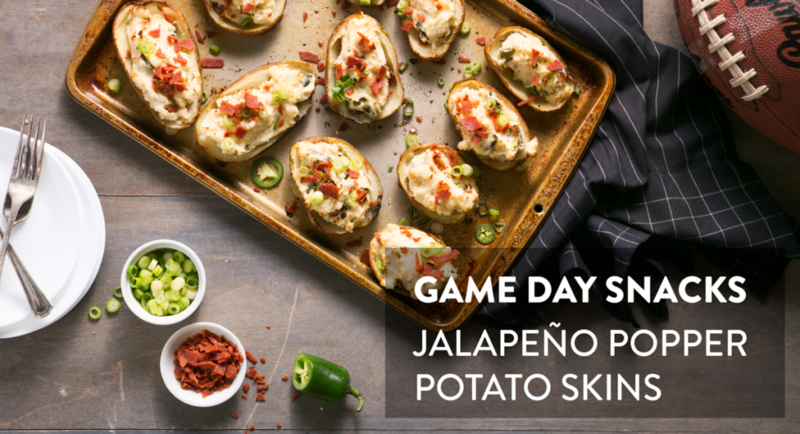 Here are a few guilt-free game day recipes that will be sure to even the pickiest of eaters. Step 1. Preheat the oven to 350 degrees. Make the Spicy Ranch Dressing and Pico de Gallo. Step 2. Spread the tortilla chips out on a large baking sheet. Top with black beans, shredded vegan cheese, jalapeños, and black olives. Cook in oven until beans are warmed through and the cheese is melted, about 8 to 10 minutes. Step 3. While the nachos are baking, halve you ripe avocados and remove the pits. Dice the flesh and set aside. Remove the nachos from the oven and top with the diced avocado and pico de gallo. Drizzle with Spicy Ranch and serve any extra sauce on the side for dipping! Combine all ingredients in a small bowl and mix well with a whisk. Chill until ready to use. Combine the tomatoes, red onion, cilantro and jalapeño in a medium bowl. Halve the lime and squeeze the juice into the salsa. Season with salt and pepper and mix well to combine. Step 1. Preheat oven to 400 degrees. Using a fork, poke holes in all the potatoes (this will help moisture escape as they cook and yield a fluffier potato!). Place the potatoes on a baking sheet and bake until the skins are crisp and you can easily pierce the flesh with a fork, about one hour. Transfer potatoes to a wire rack until cool enough to handle. Step 2. On another baking sheet, toss the jalapenos with 2 tbsp of oil, salt and pepper. Bake in the This oven with the potatoes until tender and slightly charred, about 40 to 45 minutes. Once done, chop the jalapeno into small pieces. Step 3. Carefully slice the cooked potatoes in half lengthwise down the middle. Hold each half in your palm (use a dish towel if they’re still too hot), and using a spoon, scoop out the flesh and add to a large bowl. Once you’re finished scooping all of the potatoes, lay the skins back on the baking sheet. Step 4. To the large bowl, add the non-dairy cream cheese and chopped jalapenos, mix well, and season with salt and pepper. Spoon the filling back into the skins and place potatoes back into the oven until lightly browned, about 12 to 15 minutes. Remove potato skins from oven and top with scallion and vegan bacon bits. Dig in!